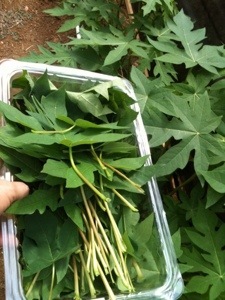 “Young Leaf” papaya leaf tea as pictured above is a much different product than the commodity herb “cut papaya leaf”. The commodity herb “cut papaya leaf” comes from the larger and older leaves from the papaya tree and it is much more economical to produce. Young papaya leaf tea is grown for tea and is picked always from a “plant”, and not from the grown tree. Both carry healing enzymes, but since the alkaloids are significantly higher in the young leaf we have focused the Julia Ruffin Project on producing them. In addition, the young leaf tastes very nice as a tea… better, in my opinion, than a green tea.